Normalisation of the relationship with Pristina, building a society anchored in the Rule of Law, creating a modern, growth-orientated and resilient economy, efficient public administration, promoting individual and collective rights, and creating a healthy environment: these are the building blocks of Serbia’s European perspective. These are the set of values and interests to protect and promote, and building blocks for the same priority: getting Serbia ready to join the EU family, Ambassador H.E. 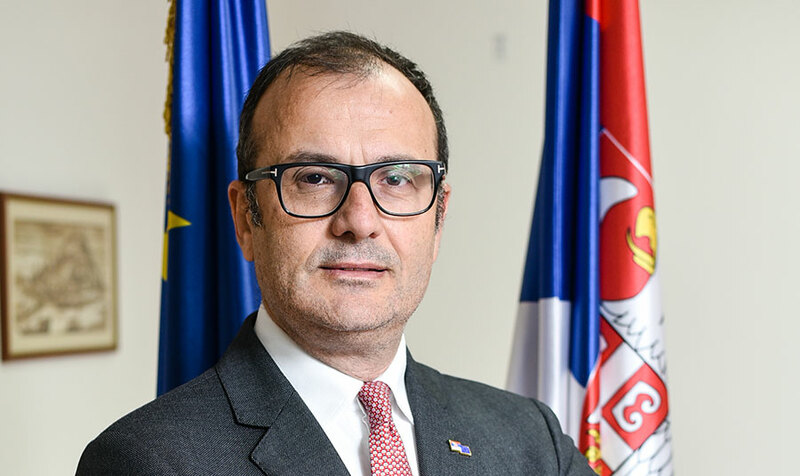 Sem Fabrizi, Head of the EU Delegation to Serbia said in an interview with CorD magazine. Read the full interview below. After serving as EU Ambassador to Australia and New Zealand, how did coming to the Balkans feel; do you believe this region will remain stable or are you inclined to agree with analyses that continue to link the Balkan countries to possible conflicts? Progressive implementation of the EU acquis during the negotiations, cross-border cooperation, important infrastructure projects – like the planned Belgrade-Pristina highway or the Serbia-Bulgaria gas interconnector – are some of the ongoing activities to pull in favour of an economic, social and political space. The increasing number of meetings of Western Balkan Leaders in the region and in Brussels shows political commitment to work together. These are all encouraging signs of the process initiated in 2003, when the EU declared the clear membership perspective of the Western Balkans in Thessaloniki. It is true that the region has been through a hard and violent history, also in the recent past, but the EU represents the very best opportunity to reconcile and together build a democratic, prosperous and secure future. The very essence of the EU’s success is the lasting reconciliation between traditional enemies who chose cooperation after World War II, as testified to by 60 years of uninterrupted peace in the EU. You have been announced in Serbia as a diplomat known to have the great trust of EU High Representative Federica Mogherini, which could allegedly help in accelerating Serbia’s European integration process. What have you set as your priorities in Serbia? Serbia has made EU accession its strategic objective. That is a fundamental decision that will define the future of this Country for generations to come; a decision that the European Union, and the HRVP Mogherini in particular, very much respect and support. My priorities are to support the necessary reforms and to bring the EU closer to Serbia and its citizens. I can count on a strong and motivated team. I have the responsibility of leading one of the largest EU delegations in the world, which is also tasked with delivering the €200 million that the EU grants to Serbia every year. In that respect, with 12 negotiating chapters are ending this year. How would you rate Serbia’s tempo so far? Serbia opened six chapters in 2017, with the last two, on company law and external economic relations, opened at the Inter-Governmental Council in Brussels. held on 11th December. Considering that some of the most complex chapters are already open, Serbia’s integration process is well on track and there is positive dynamism in the negotiations. The opening of new chapters reflects the progress achieved and I understand the attention that every negotiating step involves, including the expectation to open more chapters. However, opening chapters should not be seen as an objective in itself, rather it should be associated with progress in reforms aimed at meeting EU standards. These reforms need to be properly implemented in order to produce the expected positive results. Reforms should have political priority throughout the whole year and not just when Inter-Governmental Councils are approaching. Considering Serbia’s ambition to become part of the EU and the complexity of reforms, the tempo could be accelerated – if you went from adagio to veloce. In negotiating terms, we say that there is “no speed limit” when it comes to the numbers of new chapters that could be opened, but at the same time EU integration is a matter of the quality and depth of reforms, rather than speed of implementation. Progress in the normalisation of relations with Pristina and the reforms in the area of the Rule of Law, in particular, are two crucial elements that determine the pace of progress. Since the finalising of dialogue on the normalisation of relations with Pristina is crucial to the success of the EU integration process, does that process imply Kosovo gaining a seat in the United Nations, i.e. Serbia not opposing that eventuality? Chapter 35, which covers the dialogue between Belgrade and Pristina, is undoubtedly an important chapter and the Dialogue is an important element of Serbia’s further progress. The Dialogue, as the EU has continuously stressed, should lead to a binding agreement between Belgrade and Pristina on the comprehensive normalisation of relations. The EU does not take a position on final status, including the recognition aspect, which is for member states to decide. What this normalisation will ultimately entail and cover is up to leaders in Belgrade and Pristina to determine and agree upon. The EU, under the leadership of High Representative/Vice President Mogherini, will continue to facilitate this process. Serbian officials insist that Serbia has received a possible date for EU entry for the first time since the beginning of the accession process, citing the year 2025. Given that European officials have so far been reluctant to discuss dates, especially over the long run, how do you interpret this new strategy introduced by EC President Jean-Claude Juncker? President Juncker in his State of the European Union address last September defined a number of objectives that the EU should deliver on between now and 2025, including a credible enlargement perspective for the Western Balkans. This is a mid-term road map, which undoubtedly represents a very positive development for the Western Balkans, both in terms of the objective (enlargement) and the timeframe (2025). This timeframe is intended as a horizon during which Serbia and the region will have carried out all the reforms needed to join the EU. President Juncker also announced a strategy for the Western Balkans that will be presented in February 2018. The political message is that the EU’s doors are open, but that the region should do its part to meet these expectations. Success will be determined through good reforms and their results, not through date setting. Serbian President Vučić said this summer that the priorities of Serbia’s relationship with the EU are Kosovo and relations with Russia, while strengthening the rule of law comes in third place. How does this order of importance look to you? European integration is a transformational process that ultimately defines the type of society Serbians want to live in and the international role they want their country to play. Normalisation of the relationship with Pristina, building a society anchored in the Rule of Law, creating a modern, growth-orientated and resilient economy, efficient public administration, promoting individual and collective rights, and creating a healthy environment: these are the building blocks of Serbia’s European perspective. These are the set of values and interests to protect and promote, and building blocks for the same priority: getting Serbia ready to join the EU family. You have already mentioned the need for Serbia to harmonise its foreign policy towards Russia with that of the EU. This process progressed gradually in cases of other countries and ends with EU accession. How do you view this stance of the EU when it comes to Serbia? EU member states and countries wishing to become members have to conduct their international relations within the framework of the common foreign and security policy (CSFP\CSDP). One can develop relations with non-EU member states, including Russia or any other country in the world, provided this common framework is fully respected. It is as simple as that. Since Serbia is in the EU accession process, policy alignment is the ultimate objective, and relations with other countries can be fostered if Serbia abides by the set framework. Serbia has already taken important steps. For instance, Serbian troops are part of EU-led missions in Africa, while Serbia has also decided to join the EU’s HELBROC Battlegroup, which is led by Greece. So, Serbia is working on it, but clearly this process needs to advance further and progressively be completed, also considering important progress in the defence and security sector, including PESCO. Serbia will have to fully align its foreign policy by the time of accession to the EU. Michael Davenport, your predecessor as EU delegation head, expressed concern over media freedom in Serbia, while European Commission reports have noted that no progress has been made in this area for years. How do you see the situation? As we are in the process of preparing the Annual Progress Report for 2017, which will be published in April 2018, it would be premature to prejudge the findings of the report. However, it is evident that a number of previous recommendations, including those related to the efficiency and independence of independent regulators, have not made much progress. Domestic professional associations report an increased number of various forms of attacks and intimidation of journalists, as well as an apparent lack of reactions among judicial authorities to address these cases. Reports of international organisations also testify in this direction. All these elements do not indicate a better environment for exercising freedom of expression. The EU recently conducted a peer review that will result in further recommendations. In the meantime, it is important that the government follows through on its commitments and engages in meaningful dialogue with domestic professional associations. You have certainly heard impressions among a section of the public in Serbia that the European Union doesn’t respond sufficiently to complaints of increasing political pressure on the judiciary or violations of civil and media freedoms, due to its need to maintain good relations with the authorities in order to cooperate on issues like Kosovo and geopolitics? Yes, I have heard that. However, if they read, for example, our Annual Reports, I think they would get quite a clear picture that this is not the case. This also goes for the media, which should carry these findings, analyse them and make them available to the public. More generally, I caution against looking at EU’s approach from a binary perspective: stability vs democracy. Our approach is rather more stability and more democracy. The proof is in our negotiating mandate for the accession process: progress is determined by the normalisation of relations with Pristina and reforms on the Rule of Law. You are believed to be an optimist when it comes to the fate of the EU. You have said that you believe “the European project is unstoppable”. How will the EU look in 2018? The EU has stabilised and regained its spirit of initiative, notwithstanding recent economic difficulties, persistent migrant flows, terrorism and global instability. The economy is back on track, migration is no longer a crisis, Brexit negotiations are proceeding and we are making significant progress in security and defence. Without being complacent, we enter 2018 with a sense of renewed confidence. For the Western Balkans, next year will be characterised by a number of important initiatives, starting with the Strategy to be presented by the Commission in February. More generally, despite many challenges, the underlying fundamental elements of our Union remain unaltered. The EU – as a Union of States – is the one that has the necessary dimension to deliver better prosperity in a competitive world and the critical mass to protect its citizens in a contested global scenario. In the EU, member states pool their sovereignty to deliver their primary objectives – strong democracy, more prosperity and effective security. Isn’t the fact that many Countries, including Serbia, want to join the EU further proof, if any, of the attractiveness of our proposition? 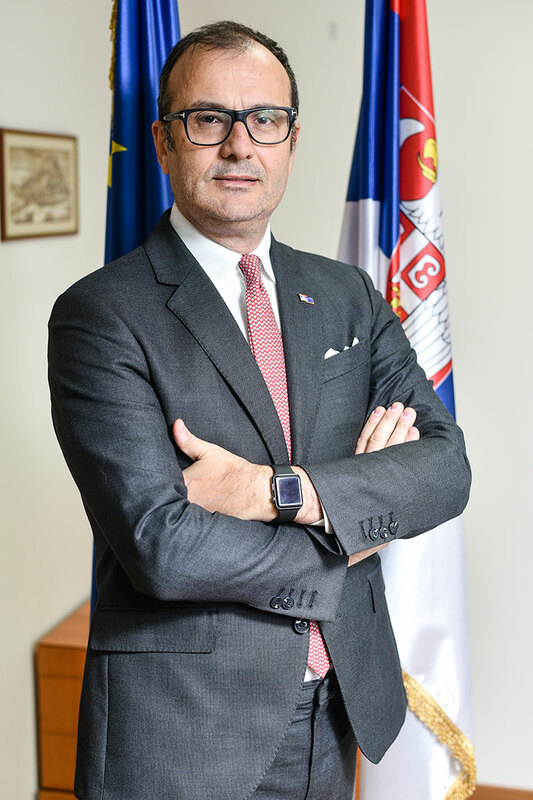 Your Excellency, after half a year in Serbia, what are your initial impressions like? Belgrade is a lively city, where there is always something going on at any time of day. The people are really friendly, the food is great and the traffic is not too bad. My family has also settled in, my sons are making friends with other kids in the international school that they are attending, and quite a number of them are Serbian. It hasn’t been too difficult. After all, they all play basketball and football. My wife can already converse in Serbian (I very much envy her! ), while I have made a number of visits outside the capital. I recently went to Vranje and Bujanovac, where I got a first-hand impression of the Serbian interior. It was an exciting two days of interaction with the local communities and leaders, and students from the bilingual university faculty in Bujanovac, built with EU support. Overall, I have a very positive impression. I sense I will have exciting years ahead of me and am very much looking forward to exploring Serbia and the region. 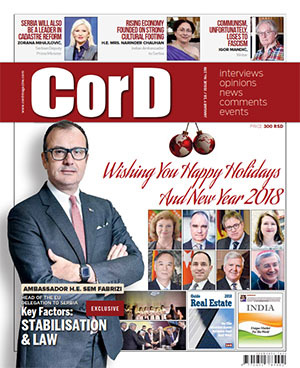 The interview was originally published in Cord magazine in December 2017.